It was Valentine’s Day 1938 and as she did every morning Mrs. Hannah Kelly on Colonial Street, St. John’s, Newfoundland and Labrador picked up the mail and was most excited to find that she had four Valentine’s cards, no doubt she thought from admiring friends and neighbours! But on closer inspection her mood changed, she was furious! She had been delivered four Vinegar Valentine Cards! 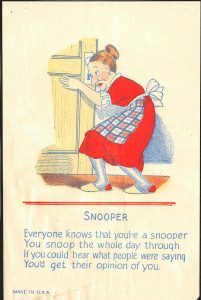 The “Vinegar Valentine”, also called “comic valentines,” were unwelcome notes sometimes insensitive and always somewhat emotionally harmful. 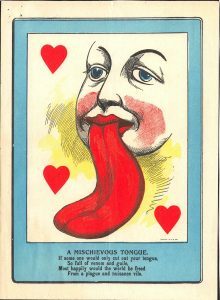 Vinegar valentines were commercially purchased containing an insulting poem and illustration. They were sent anonymously, so the receiver had to guess who disliked him or her; they were often vulgar and even rude. The vinegar cards that were delivered to 50 Colonial Street, St. John’s were very harsh. You’d get their opinion of you. Another suggested that she was “An old sow” that she was a pig!! “You’re easy and greasy, like a hog in a pen. But a mountain of flesh is not courted by men. Another suggested that she was not a pretty woman in fact the sender of the vinegar card commented that she had a big chin. When a woman has too much shin! Oh you annoying tiresome pest. Do give us pray a little rest!! Mrs. Kelly could barely contain her anger; she was not going to be quiet about these insulting vinegar cards! So on a day that should be reserved for matters of love and comfort she immediately called the Chief of Police , P.J. O’Neill. She followed the phone call with a letter that she sent to his office (February 15) claiming that she was being “persecuted” by her neighbours and that an investigation should be started. She also suggested that the four “vinegar cards “ that she enclosed in the envelope to him should be analyzed and that a comparison of the handwriting on the cards should be made with the handwriting of a few of her neighbours. She also stated that the “leader of the gang” that were persecuting her was Mable Crocker on 4 College Square and other neighbours on Colonial and College Streets. 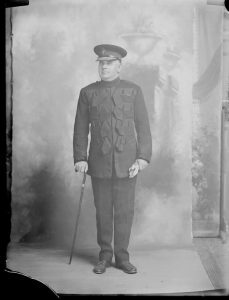 The Chief of Police sent out his detective Constable Reginald Noseworthy to investigate the matter. He obtained the handwriting from five households of those that were alleged to be part of the gang. A number of individual having consulted with their lawyers refused to give a sample. 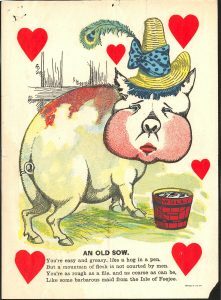 The vinegar valentines were very popular in Newfoundland the 1930’s and in in some locations in the country until the 1970’s they were still selling well. These days, it is much less likely we’ll get a horrid note in the mail as a Valentine’s surprise. This entry was posted in Uncategorized and tagged love, Valentine, Vinegar on February 14, 2019 by Larry Dohey. It is unfortunate but when it comes to matters of the heart the perception is that lawyers are not inclined to be romantic. It has been said that they have difficulty establishing an ‘emotional connection’. They are in large part driven by logic. Love, of course, does not tend to be logical. Nor let it be a long one. Should go and take the Body! I’d scorn so base an Action! You’re not an infant surely! Let’s have the General Issue! So, shall you be my lawful wife? Be Tenant of your heart for Life. Recommended Archival Collection: At the Rooms Provincial Archives see the Valentine cards of Marion Adams. 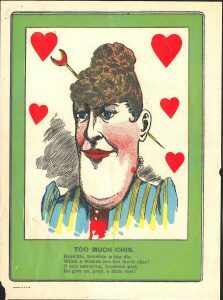 During the First World War (1914 – 1918) , Marion Adams of St. John’s received Valentine cards from two suitors. Source of Poem: The Lawyer’s Valentine, by John G. Saxe originally appeared in the New York Times, on February 18, 1860. This entry was posted in Archival Moments and tagged lawyer, love, Valentine on February 14, 2017 by Larry Dohey.